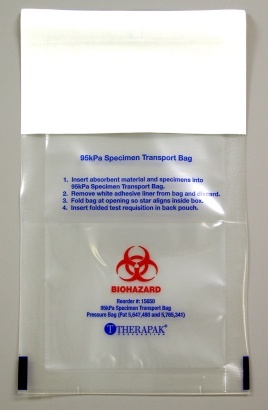 Therapak’s 95kPa transport bags are ideal to use as a secondary watertight receptacle in accordance with DOT and IATA regulations for shipping Biological Substances. DOT and IATA shipping regulations require that UN3373 Biological Substance, Category B specimens are transported in either a primary container or secondary packaging that has passed the 95kPa pressure differential test. The 95kPa certified bags feature a patented leak-resistant seal. Specimen tube(s) and absorbent materials can be securely sealed within the front pocket of the bag by peeling away the white tape and folding the adhesive down to cover the opening. The 7 x 11” size includes a convenient back pocket that can be used to hold a requisition form. Watch a short video of the pressure testing of the Therapak 95kPa Adhesive Seal Bag.